Hail to the Bonus Queen! Kneel before the most beautiful Queen of all times and expect some massive wins in return! Make a small $25 and you’ll be invited to sit on Cleopatra’s throne while you collect prizes with help from symbols like the Pyramids. Landing 3 or more will award 15 free spins with all wins tripled. 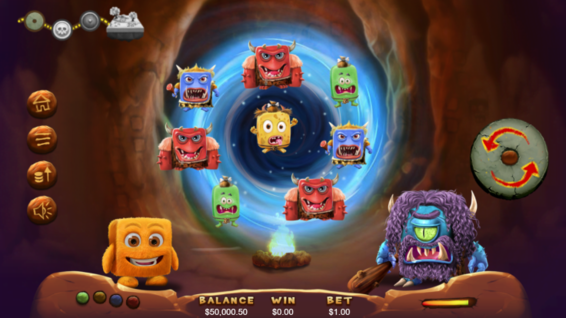 Retrigger 15 additional free spins by landing 3 or more scatters during the free spins round. Wild: Cleopatra is the star of the show and she is a wild substitute symbol that will substitute for all other symbols except scatters. 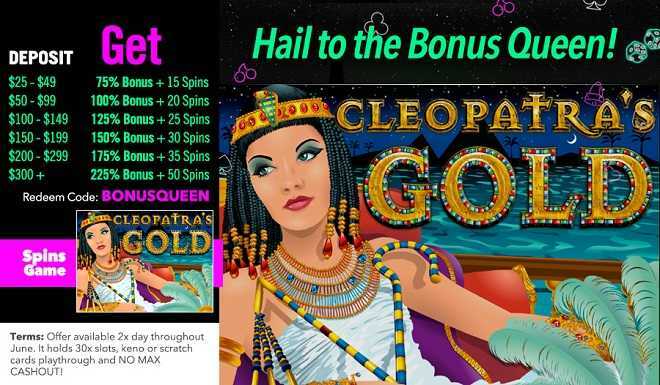 She doubles the payout of any winning combination when 1 or more Cleopatra symbols participate in a win. Scatter: The Pyramid is a scatter and will pay regardless where it appears on the reels at the conclusion of a spin, if two or more appear. Get 3 or more in a spin to activate the FreeGames feature. Free Games Feature: You are granted 15 Free Games with TRIPLED prizes. The feature can be re-triggered if 2 or more pyramids appear in a Free Game. Progressive jackpot: The tempting progressive jackpot is above the reels and can be won randomly at the end of any spin! Become part of Uptown’s royalty alongside Cleopatra’s Gold wins when you deposit $25 and up twice per day throughout March! Offer available 2x day throughout June. It holds 30x slots, keno or scratch cards playthrough and NO MAX CASHOUT! One can never get enough of the legendary Jackie Chan – and for good reason! The martial arts genius always has something up his sleeve and this time he’s back to the land of slots in the new Fire Dragon game. Join him and learn some new self-defense techniques and winning tips with help from a 111% Match Bonus + 111 Dragon Spins! Fire Dragon packs 5 reels and 20 paylines with energetic movie stunts, car chases and the most exciting martial arts moves around! 111% Match Bonus + 111 Dragon Spins! Offer requires a $35 min. deposit and it holds 30x slots or keno playthrough and no max cashout. Redeem 2x this month! This is a slot machine unlike any other. It is breaking with all tradition by creating a sharp and modern-looking game with NO REELS that will greatly appeal to the newer generations. The main character of the game is a fuzzy looking creature called Cubee. The goal of the game is to defeat enemies while traveling through 3 different epochs: The Stone Age, The Era of Piracy, The Viking Age and finally culminating in CubeeLand – where Free Games with multipliers are played! Cubee has no reels. The symbols are floating enemies appearing in a time travel portal. The defeated enemies will grant payouts based on the pay-table. To defeat an enemy Cubee must match their strength. Cubee is heaps of fun once you get the hang of it. It doesn’t take look before you understand the dynamics of this ground-breaking game! Energy Ball: When appearing in a game round, each Energy Ball will increase Cubee’s strength, allowing him to defeat more powerful enemies and accrue higher payouts. Rocco: This is the name of Cubee’s arch-enemy. He stands opposite Cubee in each epoch. When a weapon appears in a game round, it will strike Rocco to lower his stamina. Once defeated, Cubee travels to the next epoch. Era of Piracy: Every time a cannon appears in a game round, the Free Games tally number will go up by a point. The Viking Age: Every time a bow appears in a game round, the multiplier number will go up by a point. Cubeeland: One you reach Cubeeland, you play your accumulated Free Games with the earned multiplier! Cubee is rewriting the history books on online pokies. Imaginative, dynamic and great design makes this a great addition to Uptown Aces game collection!